Pete Fernandez should be dead. His life -- professional and personal -- is in ruins. His best friend is dead. His newspaper career is past tense. His ex is staying with him as her own marriage crumbles. On top of that, the former journalist finds himself in the eye of a dangerous storm; investigating a missing girl with an unexpected partner and inching closer and closer to a vicious, calculating killer cutting a swath of blood across Miami -- while at the same time battling his own personal demons that refuse to be silenced. 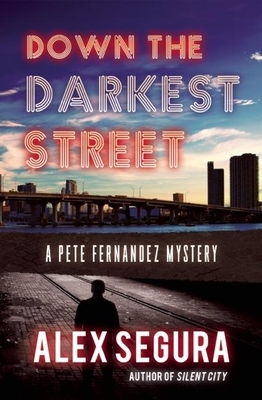 Down the Darkest Street, the hard-boiled sequel to Alex Segura's acclaimed debut, Silent City, tells a tale of redemption, survival and the sordid backstreets of Miami -- while asking the question that many are too scared to answer: When faced with pure darkness, would you fold or fight? Alex Segura is a novelist and comic book writer. He is the author of the Miami crime novel SILENT CITY, the first in a series featuring Pete Fernandez. SILENT CITY and its sequel, DOWN THE DARKEST STREET, out this year via Polis Books. He has also written a number of comic books, including the best-selling and critically acclaimed ARCHIE MEETS KISS storyline, the "Occupy Riverdale" story and the upcoming ARCHIE MEETS RAMONES. He lives in New York with his wife. He is a Miami native. Visit him online at alexsegura.tumblr.com or @alex_segura.